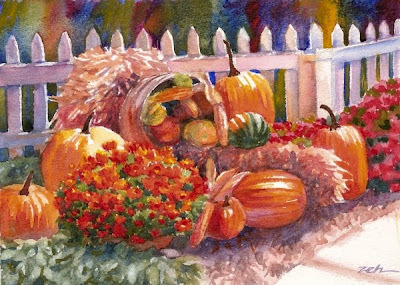 Pumpkins and chrysanthemums, a basket full of treasures from the garden, and a couple of hay bales make a perfect autumn painting. This This painting has been sold. Visit my website: Zeh Original Art to see more of my artwork. Thanks for stopping by today. love your intense color and handling of the medium! This one did turn out well. There's so much in it, I wasn't sure if it would, but the swath of warm colors ties it all together. Thanks for your comments, Krys!